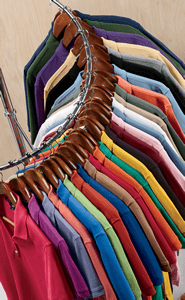 65/35 cotton/poly oxford with easy care stain-release. Pearlized buttons with Harriton logo. Extra stitching for strength at seams and buttons. Flat-felled seam finishing. Long-sleeves. Full back yoke and back pleat. Left-chest pocket. Button-down collar. Two-button adjustable cuff with one-button sleeve placket.